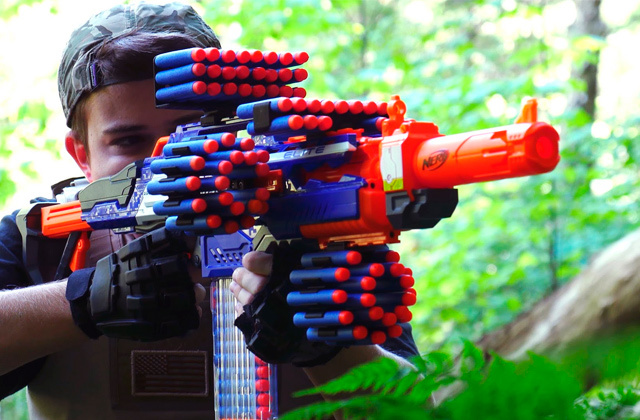 Impressive carrying capacity that can withstand an average teenager and adult person. The whole frame is not too lightweight. Luckily, you can lift one side up and pull it around. The long-awaited Razor Crazy Cart for adults boasts amazing functionality and revved-up engine with astonishing maximum speed. If you ever wanted to have a racing go-kart when you were a kid, go for this one. Unique Spark Bar allows you to light up the race with a dazzling visual effect. The spare bar is included. 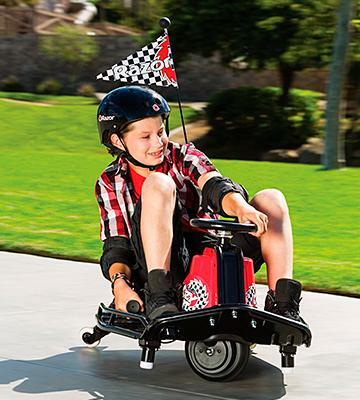 With this amazing Razor Ground Force Drifter Fury Ride-On go-kart, your kid's dream can finally come true. Absolutely great for drift races and performing riding stunts. Super Slider POM rear wheels will change your riding style to crazy drifting. 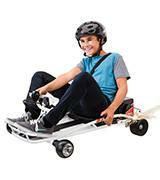 Race-tuned chassis simplifies control over the kart and enhances maneuverability. The tires wear out pretty quickly but you can always replace them since they are sold at an affordable price. 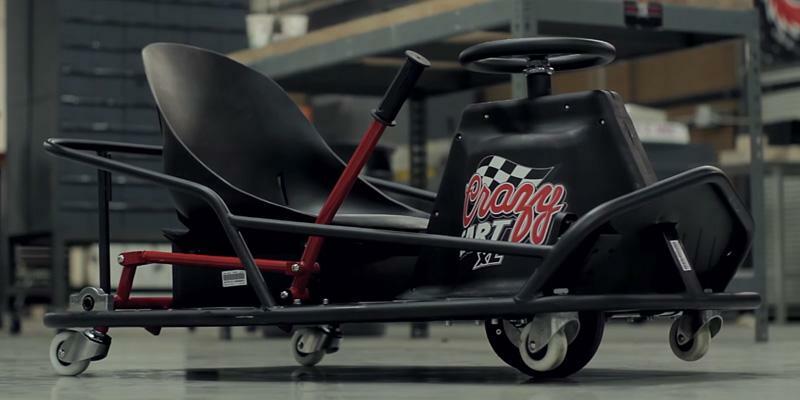 Even a novice racer would become a czar of drifting with this go-kart. Pulling off power slides, making sharp turns, 180s, and fish tail slides are not a dream anymore. The drift bar offers a racer an ability to vary the caster wheels' angles and drift forward, backward or in any other direction. Front caster wheels are meant to prevent the kart's tipping over. There are no brakes but you can stop the vehicle by taking a foot off a gas pedal. The ultimate kart under Razor brand is a perfect choice for crazy and thrill racing. With this model, you can shift between calm riding to drifting just by pulling up a drift bar. Enjoy these crazy wheels. It takes less than a minute to attach the frame to a hoverboard. 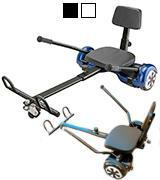 Features an adjustable frame and backrest position. The front wheel is designed for riding on smooth roads only. A remarkable example of how you can take a nutty idea and turn it into a viable product. With this Hover Go Kart, you can turn your own hoverboard into a real electric go-kart that is safe for kids, accessible for adults, and equally entertaining for both. Single caster front wheel, Compatible with all major 6.5" - 10" hoverboards brands. Ready for the Crazy Ride? We have to upgrade our review, as the bestselling Razor Crazy Cart is now available in eXtra Large size. Unique in its class, this electric kart has received an improved, sturdier, larger deck frame that makes it even more suitable for adults than the previous model in a series. 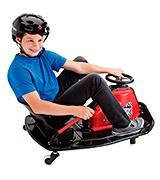 Now, you can share your kid's kart racing hobby by getting this model for yourself. Anyhow, the frame can support enormous 240 lbs and features an elevated seat. Without it, a tall person would have to lean forward way too much in order to sit on it. 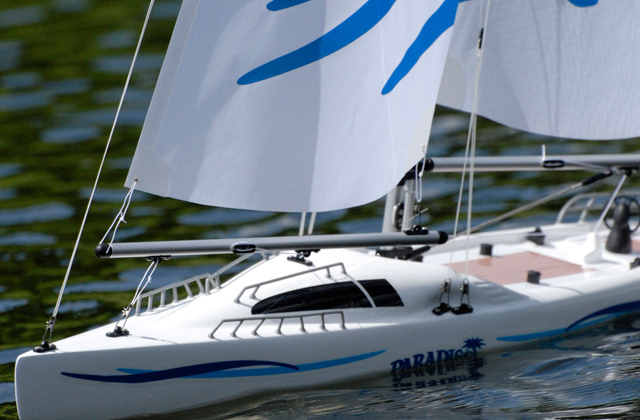 There are several key features worth mentioning that will help you take the lead on the track. Namely, the steering wheel has a full 360° rotation, allowing you to find the perfect steering angle on turns. Next one is the drift bar that will help you overcome your opponents on the insides by controlling the drift. Finally, the chain-driven motor is another part that was given an upgrade. Put the pedal to the metal and speed up to the maximum 17 mph on the flat road. But beware, there's no break, so be safety-wise and at least wear a helmet. In order to stop, release the pedal and pull the drifting par. That way, the go-kart will turn around, lose its momentum, and stop. Concluding, we can recommend this model to everyone who is old enough to drive it. Also, if you are a go-kart track owner, having a couple of these will help you attract more adults to your place. 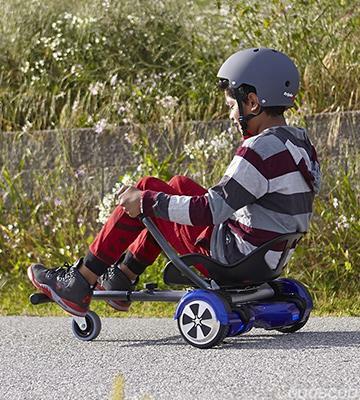 Along with the elaborate name, this Razor Ground Force Drifter Fury Ride-On electric go-kart can boast a thought-through design for balanced performance. The high-torque chain-driven motor allows reaching the 12 mph maximum speed in a matter of seconds. 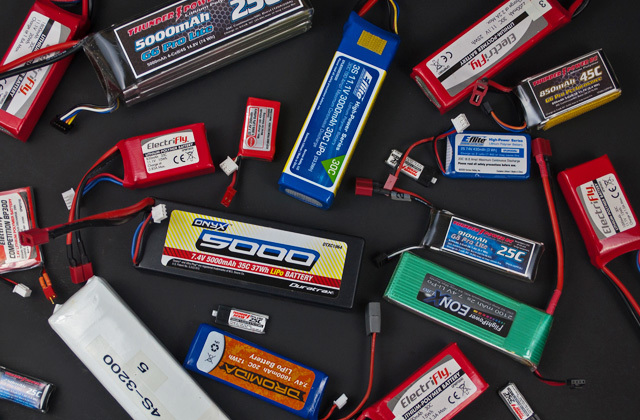 A pair of 12V batteries are enough to power it up for around of 40 minutes of continuous driving. The recharge takes around 11-13 hours. Next, let's take a closer look at the wheels. The front pair is controlled with a U-shaped steering wheel. The rear ones have the Super Slide POM tires that have advanced road adhesion and offer additional maneuverability while taking fast corners and drifting. The neatest feature here is a Spark Bar. By pulling a side bar handle up, its other tip will produce fiery sparks behind the kart that look immensely cool at dusk and nighttime, resembling the sparks. As for the safety, this kid go-kart is well-built, has a safety belt, and also has a brake lever on the steering wheel for deceleration. The kart is very stable on the road, so the risk of bowling over is minimal. Still, we urge the kart drivers to wear a helmet and elbow guards on the track. Ground Force Drifter Kart is another cool toy under Razor brand. And of course, we cannot fail to compare and contrast this model with its predecessor - Razor Ground Force Electric-Go Kart. These two go-karts share the same technical characteristics but still have some differences. First of all, let's look at their affinity. These models are both based on a solid steel frame that guarantees excellent vehicle's stability on a road. Both karts are equipped with high torque motors which produce the speed of about 12 MPH and feature equal run time of about 40-50 minutes on a single charge. Each electric go-kart is equipped with 24V (two 12V) sealed lead acid rechargeable battery system that requires 12 hours of charging. 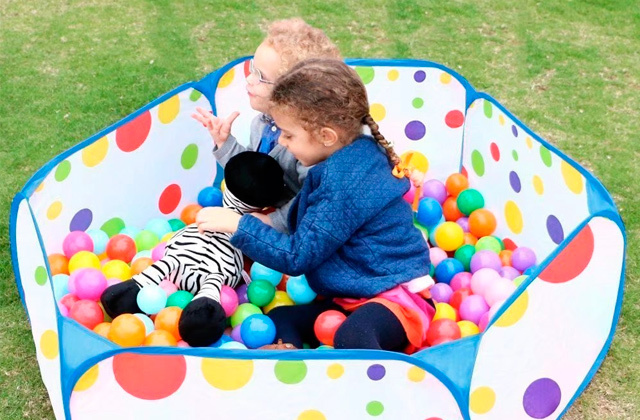 The produced speed is pretty decent for children of 8 years and up, kids will get their portion of adrenaline rush and you will not worry too much of their safety. We would like to emphasize that both electric go-karts feature variable speed throttles and hand-operated braking systems that are located on a steering wheel. It means that even a novice small racer will learn how to control the kart in seconds since hand-operated acceleration and braking systems are much easier for children than the foot pedals. But what's the difference between these karts? If you look at Ground Force Drifter Kart rear wheels you will clearly see that it has another type of tires. The producer decided to equip the new go-kart model with Super Slider POM tires which are meant to change driving style dramatically. To specify, a calm driving turns into crazy racing with pulling off power slides, bat turns, 180s, and fish tail slides. 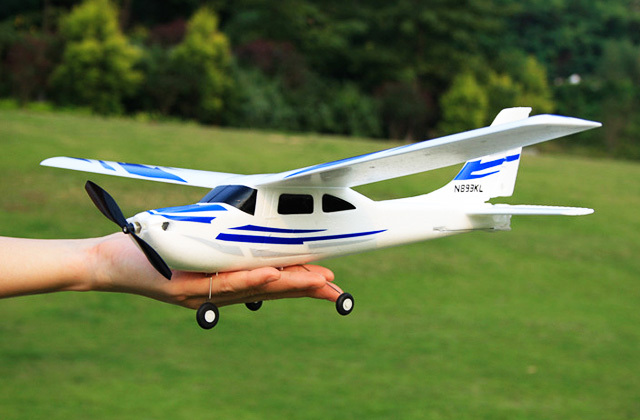 Before purchasing one of the 2 given models you should consider your kid's driving skills. 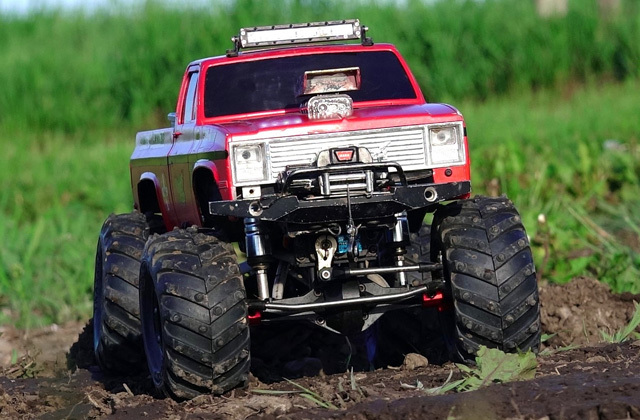 A novice racer will adore Razor Ground Force for riding on special tracks or near the house. But if your kid is thrill-addicted and a kart you are going to purchase is not the first electric vehicle of a young racer you should definitely choose Ground Force Drifter Kart. 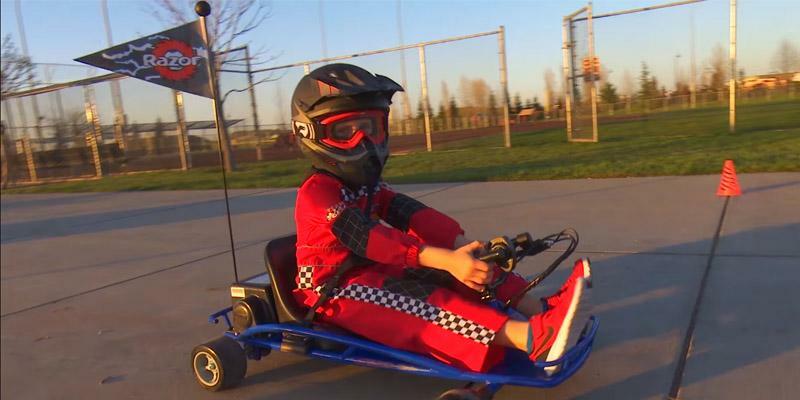 This go-kart will let your kid feel a real F1 pilot. Drift, slide through corners, throw fish tails or fast 180s any time you want. The one problem with the Ground Force Drifter Kart is that the rear tires wear out quite quickly and need to be replaced. Fortunately, the tires are not very expensive and can be replaced easily. For added safety, the go-kart is designed with a seatbelt but we'd recommend you to opt for a crash helmet that will protect both the soft tissues and brainpan of a racer against injuries while drifting. It is preferable to purchase Razor groundforce drifter rear wheel set in advance. 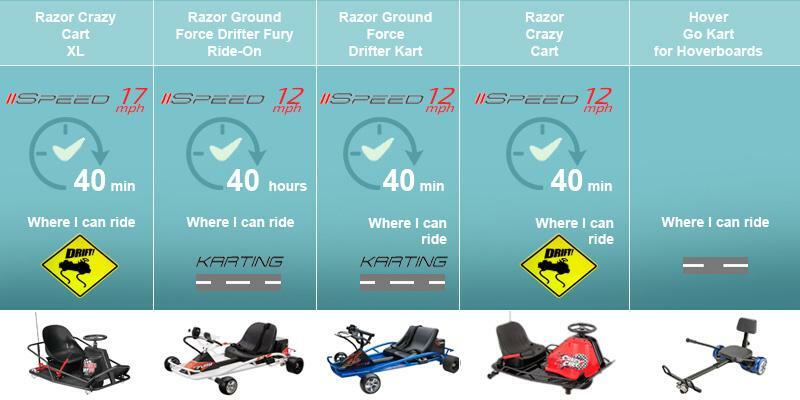 Razor Crazy Cart is highly commendable among the number of reviewed electric go-karts since it is designed especially for speed, fun, and adrenaline rush addicted racers. The very electric go-kart resembles an amusement ride and is nicknamed "Crazy cart" not without a reason. So, let's get into the nuts and bolts of this crazy vehicle. The electric go-kart is based on a solid steel frame with a pneumatic front tire that is connected directly to a steering wheel. Additionally, there are two anti-tip caster wheels on the front corners of the go-kart and dual rear caster wheels in the back connected to the drift bar. And this is where the crazy magic happens. When you are driving normally the rear wheels are angled about 45 degrees but when you pull up the drift bar you send the electric go-kart into a 360-degree spin. 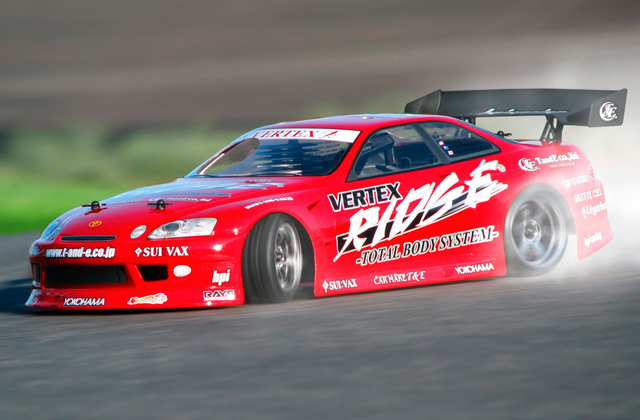 The racer can vary the caster wheels' angles so that they can slide in any direction and the vehicle may drift forward, backward, sideways, diagonally and everything in between. The electric go-kart goes up to 12 MPH, this speed rate doesn't seem that fast but due to low-slung styling and low clearance a racer feels like he is scorching along. 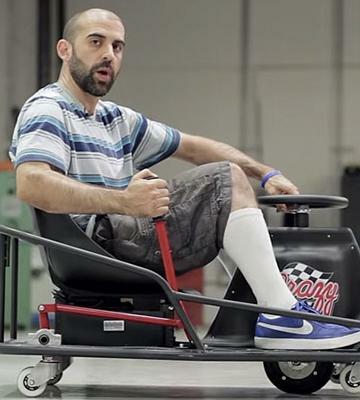 What makes this go-kart far crazier is that there are no brakes! To stop you just take your foot off the gas pedal and the engine will slow down. 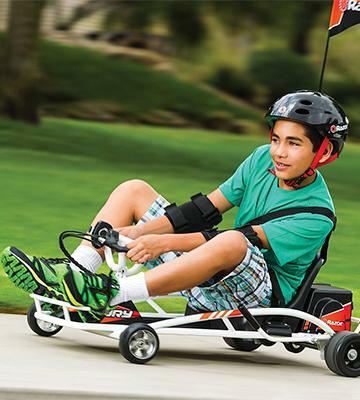 We bet that if you get Razor electric go-kart for you kid, you'd definitely try to race on it yourself! 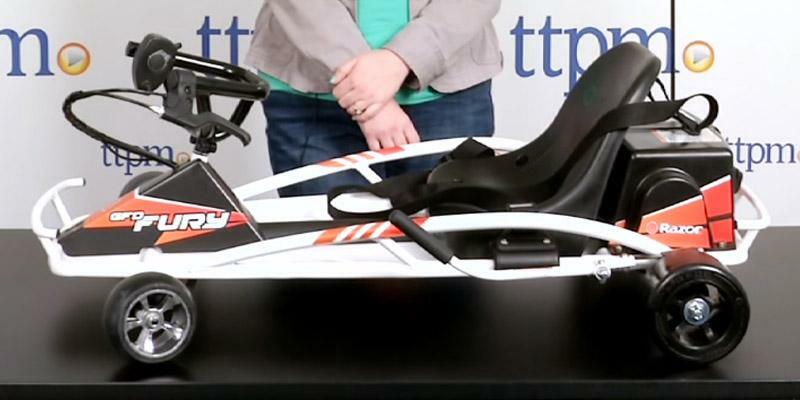 The manufacturer has seen along and designed an electric go-kart for adults that is able to race faster and can hold bigger loads. Thus, purchase the Razor Crazy Cart for your kid and a bigger one model for yourself to contest and get a real crazy thrill. 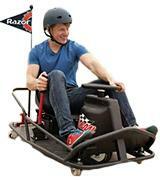 Razor USA is a designer and manufacturer of human and battery powered vehicles. The company was founded in California in 2000 and the first produced vehicle was a compact folding kick scooter. This scooter gained such a big popularity that the company sold approximately 5 million items just for the first year. Nowadays Razor produces kick scooters, electric scooters, electric ride scooters, caster-driven scooters, bicycles, skateboards, pads, and helmets. The company picked up Toy of the year award for Crazy Cart go-kart manufacturing and the very model is as popular as their first kick scooter was. What makes this company the leading one on the USA electric cars market? it is quite simple! 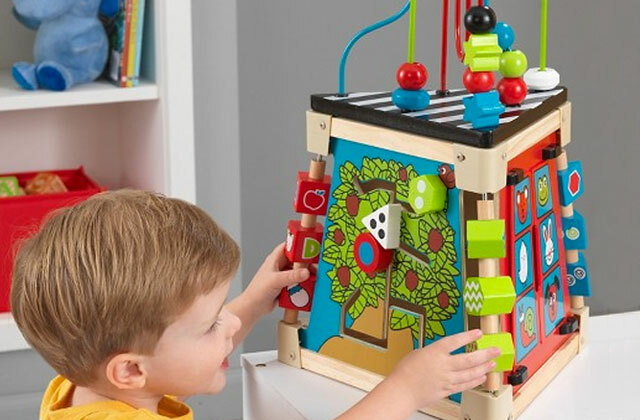 Innovations, high quality, and affordable price makes their goods hotspot for kids and adults alike. 360-degree spins and crazy rides are not always safe, so consider kid's safety and buy Mongoose BMX bike gel knee and elbow pads and Razor V-17 youth multi-sport helmet. As the hoverboards become more widespread, it's only natural that people have designed several accessories for these devices. One of them is this Hover Go Kart for Hoverboards by Hovergogokart. Simply put, it's a frame with the seat that has no rear wheels. 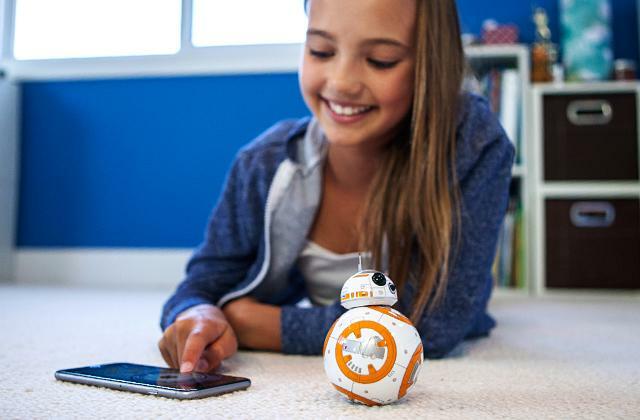 Instead of them, you attach the hoverboard to it and then control with two long levers on the sides. A single small caster wheel in front is 360° rotatable. Although the idea might sound a bit silly at first, we were actually impressed with how easily they work together. Most of the hoverboards have at least 5 mph maximum speed. 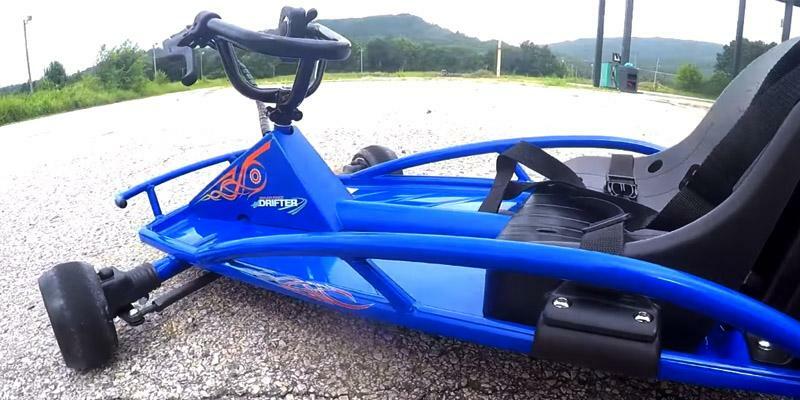 By combining this frame with a more powerful model, you can get a go-kart with around 8-11 mph speed. Thus, it will show the best result on the wavy tracks with lots of corners where the high speed is not required as much as a maneuverability. Speaking of it, the steering is done by pulling up or down the side levers that are attached to the left and right parts of the hoverboard. 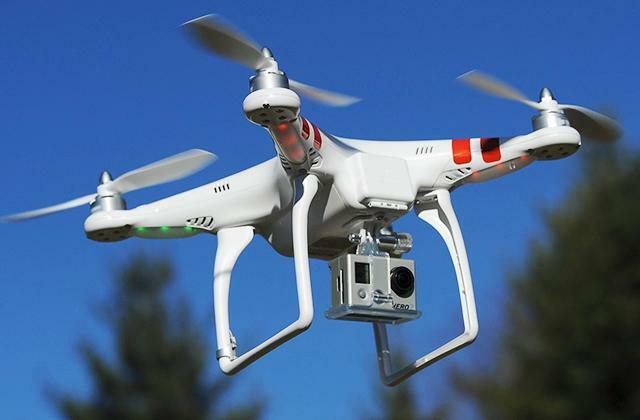 Note, the frame can only withstand up to 220 lbs load, which is an average supported weight of a hoverboard. The pole and backrest can be adjusted for kids and adults who are up to 6'2" tall. Overall, it is a great solution if you have a hoverboard but want to race with your friends. With it, you can get pumped up for the race and get the rushing adrenaline feeling while riding all the same. Every child dreams of having his/her own vehicle. Of course, you can opt for a push cycle or scooter but would you fulfill your child's dream about thrilling riding on a trail, dust or sand? Doubtful! 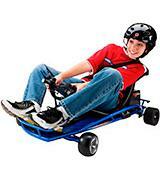 Surprise you child and present him an electric go-kart to ride for fun or race for sport. Who knows, maybe your boy is destined to become a racer at Formula 1 in the future? 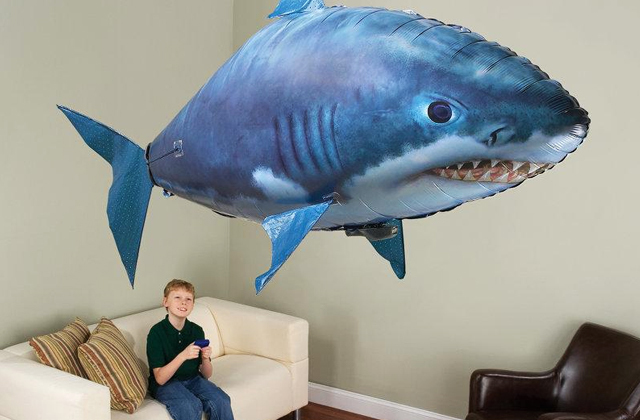 Anyway, your child would be on cloud nine on getting such a great present. Moreover, the karts are pollution-free and emit no smoke, thus they are appropriate for indoor use! However, purchasing a go-kart may cause some concerns of a kid's safety while riding a vehicle. Therefore, opt for a kart that doesn't build up high speeds and consider the model with your child's age and weight in mind. We have picked up 5 best electric go-karts that will meet the requirements of the pickiest consumers. 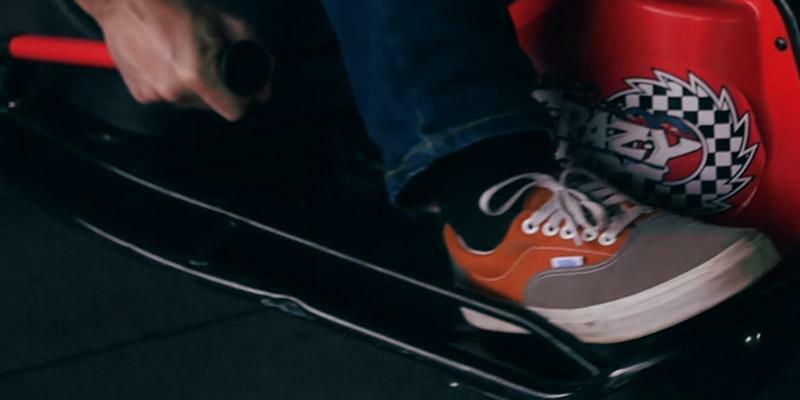 As a side note, we also recommend you to check out electric kick scooters. These vehicles are meant not only for children but also for adults, thus you can ride it to get to your work or maybe the local mall, park, school or college. 1. Buying a Go Kart, DoneDeal. 2. Electric Go-kart, Wikipedia. May 30, 2016. 3. 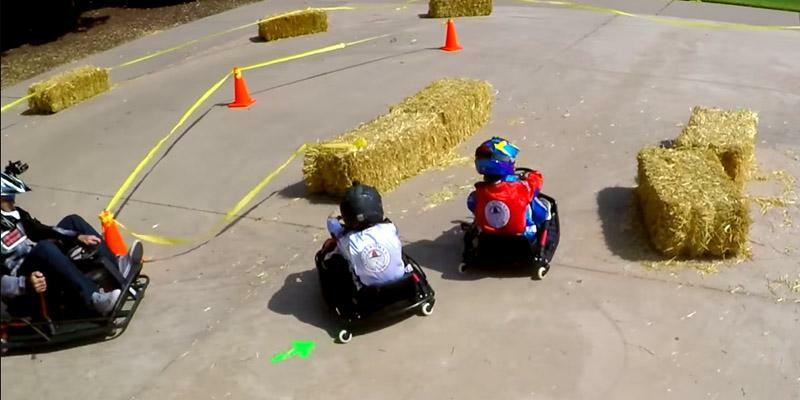 Electric vs. Gas-Powered Racing Go Karts, LERA Blog. 4. 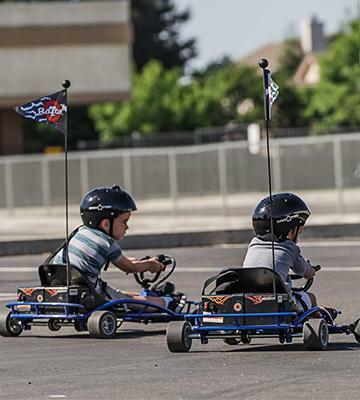 How to Build Your Own Go-Kart: A Step-by-Step Guide for Homemade Fun!, HobbyLark. August 25, 2016. 5. How to Successfully Drive a Go Kart, wikiHow. 6. Kart Racing, Wikipedia. August 16, 2016. 7. Nick Statt Nest CEO Tony Fadell is Behind Electric Go-kart Startup Actev Motors, The Verge. May 27, 2016.